FRANKFURT -- Ford Motor Co. will suspend production at its plant in Cologne, Germany, for as many as eight days before the summer break starts in July because of falling sales in southern Europe. Ford will decide later on any additional days of production stoppages through October, said Ragah Kamel, a spokeswoman at the automaker's European headquarters in Cologne. The plant, which makes the Fiesta subcompact car, is scheduled to build 345,000 vehicles this year, roughly 6 percent fewer than in 2011, Kamel said on Tuesday. More than 85 percent of the Cologne plant's production volume is exported and, "with an average utilization of 85 percent, the plant is still relatively busy," she said. No similar measures are planned at Ford's other German manufacturing site in Saarlouis, she said. The cutbacks affect 4,000 of the roughly 17,500 employees at the factory. Summer vacation at the plant is scheduled for July and August. Ford will apply for German government assistance to make up for the curtailed hours and will pay additional compensation, the company said. 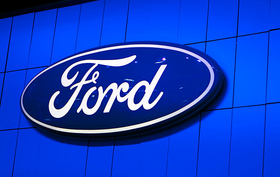 The cutback was reported on Monday by the Cologne newspaper Koelner Stadt-Anzeiger, which said Ford planned as may as 16 days without production from May through October. Ford passenger car sales in the 27-member EU states plus Switzerland, Norway and Iceland fell 8 percent to 131,410 in March in a total market down 7 percent to a 14-year monthly low of 1.5 million, according to industry association ACEA. Among national markets, the sales slide accelerated in much of southern Europe with sales down to 27 percent in Italy, 23 percent in France and 5 percent in Spain. Austerity measures introduced by governments as a result of the region's sovereign-debt crisis has hurt consumer confidence, causing new-car sales to drop.